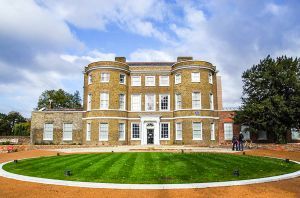 This fascinating museum and gallery is devoted to the life and works of William Morris, a remarkable Victorian artist, social activist, and founder of the Arts and Crafts movement. The Gallery is housed in an elegant Georgian home called Walter House, built about 1750. Surrounding the house is parkland (now Lloyd Park) that is much earlier, containing remains of a medieval moat. Morris was born in Walthamstow to a well-to-do middle-class family. The family lived at Walter House from 1848-1856, so it seemed a suitable venue for a museum dedicated to the life and work of this remarkable man. William Morris was one of the most influential artists, philosophers, and publishers of the Victorian era. He helped launch the Arts and Crafts Movement, establish the modern fantasy fiction genre, and revitalise the British textile industry. It is impossible to overemphasise his influence in late Victorian art, and influence which is still felt today with the Morris & Co firm he helped found. The main focus of the gallery exhibitions are objects from Morris' amazing artistic output, including fabrics, carpets, printed works, embroidery, stained glass, and painted tiles. The displays include art by Morris himself but also by his artistic circle, including the Pre-Raphaelite luminaries like Ford Madox-Brown, Edward Burne-Jones, and Dante Gabriel Rosetti. A large part of the art collection was bequeathed by Sir Frank Brangwyn, who studied under Morris. The Brangwyn Gift includes drawings, prints, and paintings by Morris and other late Victorian artists. Some of the more important items on display are the medieval helmet and sword designed by Morris as props for murals he created for the Oxford Union. There is the original design of the very first Morris wallpaper (the Trellis design) as well as early tiles depicting the Labours of the Months. Aside from works of art, there is a multitude of objects reflecting Morris' life, from his coffee cup to his satchel. In addition, there is a large collection of art by Arts and Crafts Movement artists who were inspired by Morris, from glass to furniture, textiles to pieces of ceramic. The William Morris Gallery is, as far as we know, the only public gallery dedicated to William Morris, and to have it housed in the Morris family home makes it a very special place indeed.